This premium quality, signed, limited edition lithograph is available for purchase below. Prints shipped in sleeves with white acid free backing board. For Credit Cards purchases, please use the shopping cart. Checks or Money Orders are also acceptable. Please call (860-535-9987) or E-mail for pricing outside the continental US. 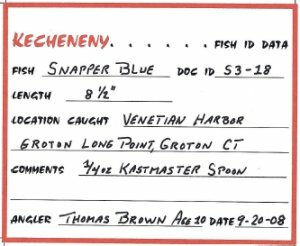 One day a fellow mentioned to Jack that while he had a Harbor Blue, and a Bluefish in his collection, he didn't have a print/rubbing of a Snapper Blue. Jack thought about this for several days and the answer finally came to him. He would give his grandson, Thomas (age 10) the task of providing the "subject". Thomas’s grandmother lives on the shore where he spends a great amount of his summer vacation. He often fishes there for Snapper Blues. Jack instructed him to mark out two lines on the floorboards of the dock. One mark was to be placed at seven inches and a second line underneath that at eight inches. Gramp needed a Snapper Blue between seven and eight inches long for his next fish rubbing. A few days later, upon returning home, Jack found a bucket in front of his garage. In it was the Snapper Blue he was looking for. Thomas had made a special delivery to Gramp. It turned out to be one of the finest rubbings Jack has ever made. And that's the story of the Snapper Blue. 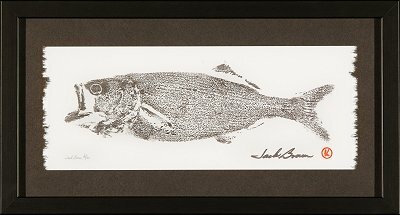 Snapper Blues .... Are a baby Bluefish around 6 to 10 inches long. Harbor Blues ...... Are juveniles around 12 to 18 inches long. Bluefish ............. Are the fully grown fish 20 inches and longer.